KABUL, Afghanistan (CNN) -- Paid for with U.S. dollars, Afghanistan's Highway 1 was supposed to symbolize a path toward a bright future when it was repaved five years ago. 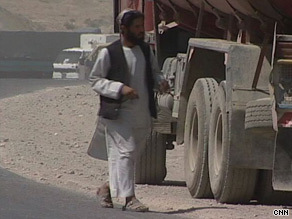 Trucker Mohammed Qasim takes his fuel tanker down Afghanistan's Highway 1 once a week. The $300 million project smoothed over the highway's rough potholes and cut in half the 12-hour drive time from the capital, Kabul, to the country's political center, Kandahar. But today, roadside bombs have re-scarred the road, and Taliban militants routinely stage brazen attacks on its travelers. The journey between the two cities now takes at least nine hours, and people risk their lives when they travel on the road. "It's been blown up by landmines, and there is no security on it," truck driver Mohammed Qasim said. It is a symbol of the broad, complex problems in Afghanistan. Eight years after American forces invaded the country and ousted the Taliban regime in the wake of the September 11 attacks, combat continues with rising death tolls among coalition soldiers, Afghan security forces and civilians. CNN's Anderson Cooper takes you inside Afghanistan. He's live from the war zone. And politically it's not much better. Afghanistan is a nation in limbo. The final results of last month's presidential election have been stalled by a storm of corruption allegations. Having turned its back on Afghanistan throughout the 1990s once the Soviet military lost a war here, the United States has spent these eight years trying to make good on its past neglect. Yet true, undeniable success is hard to see. The fact that the Taliban have been able to strangle the life out of Highway 1 is a testament that there's simply not enough American, British, international or Afghan troops to secure it. What once had been an American project hailed as a sign of progress has become a mark of a mission in crisis. The threats have not stopped Qasim from driving his fuel tanker down the Taliban gauntlet once a week, dodging potholes and fearing for his life. He said he feels completely exposed by the lack of security, but it is the only way he can provide for his three children. "I'm compelled," he said. "How else do we eat? There's simply no alternative."